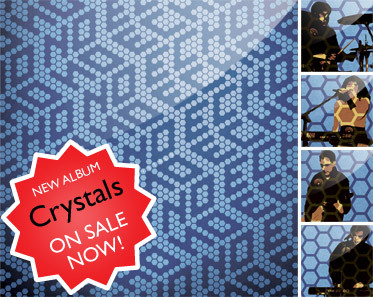 New album "Crystals" on sale now! Since our debut opening for Information Society at the Crystal Ballroom we've been carefully recording our CD and writing new material. Crystals is eight solid tracks clocking in at about 32 minutes of rocking electronic goodness. Listen to the sample tracks and click on the BUY NOW button to get a copy. It's only $6 plus $2 for shipping. Welcome. We are Echo No Echo. Based in Portland, Oregon, we sound like electro pop rock and consist of the following four people. Check out these video clips from our performance on the Ethos Live television show from February 1, 2008. Pictures from the 2006 Crystal Ballrom show are now available. Grab our artwork and bio on our press materials page. For the morbidly curious or for superfans, you can look at, watch and listen to all things ENOE.